When the cold weather especially important becomes the question how to knit socks knitting for beginners quick and easy. Homemade wool products homely and cause the proud needlewomen. 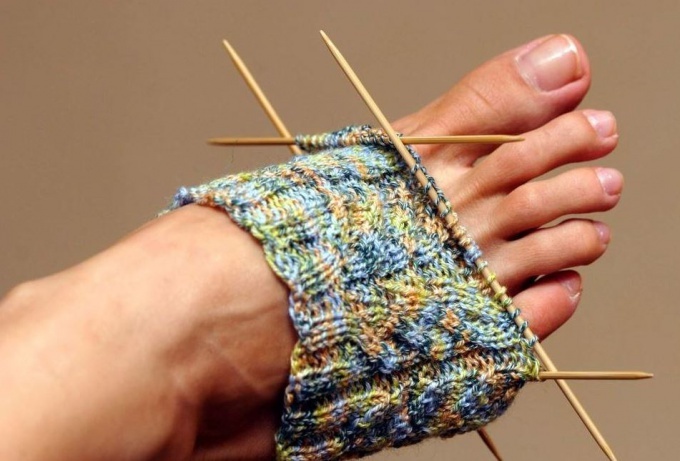 The most difficult part for beginners might be performing heel or knitting on 5 needles. Meanwhile, work on the socks can be greatly simplified. If you still don't know how to knit the heel of the sock, knitting a spiral on the basis of a simple elastic headband is a great way for you to get a warm dimensionless product of wool yarn. Learn the alternating front and back loops: 2 front and 2 back (2x2); 5 front and 5 back (5x5). Making a sample of the gum 2x2, decide on the desired coverage of the tibia and the number of primary loops. Divide them into 4 equal parts. Enter the desired number of the thread handles, place on four hosiery knitting needles and run the elastic band 2x2 with a height of 3-4 cm Now you will continue knitting socks spiral. Do 4 laps, but with alternating 5x5. When you have finished knitting the fourth hosiery knitting needle, attach the other end of the line segment color yarn to mark the important point. In this place you will begin to shift loops to the spiral pattern. Tie the next round gum, but at the same time slide the pattern by 1 loop to the left. Follow 4 in a circular row and move the thread mark at the beginning of the current round. Again move the pattern left on gum 1 thread of the shackle. Knit the next socks knitting, looking at a finished sample. You should have a canvas tube, which is spiral curl. 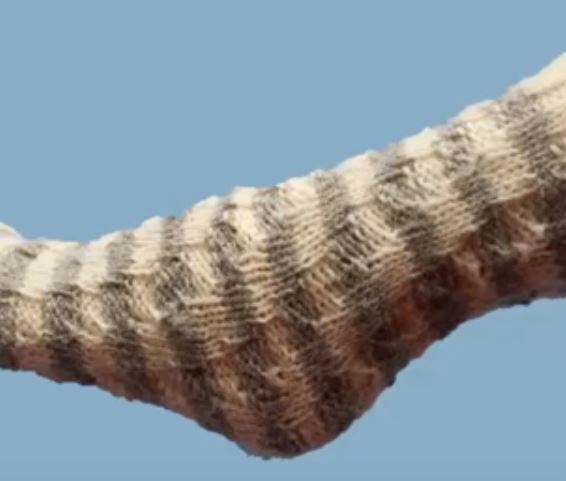 the "tail" tuck in the finished spiral sock. Please note: you will have a simple heel spokes, a spiral like the whole sock. This product is especially recommended to children: length of sole is it is dimensionless, it will be small only if the increase in coverage of the tibia. The second way to knit a sock on the needles for beginners quickly and easily to help cope with the task, but in this case, get sewn together product. Start doing work with sample gum 2x2 and use it to determine the calf circumference and the desired length of the stacked region. Enter the loop 2 knitting needles connected by a line, and make the forward and reverse ranks of blade height of 4-6 cm. Take away a canvas for the heel in each row, reducing the number of side loops of the details, until there are 8 of the thread lugs. Edge received the products details dial on the spokes and continue knitting a sock on 2 knitting needles of the front, until you bring the work to the toe. For its formation divide the knitting into 4 and cut each promazyvaya together a pair of adjacent loops until the spokes will not remain 4. Pull the toe and tighten the tip of the working thread. Run the connecting seam. Fresh product do the pattern. 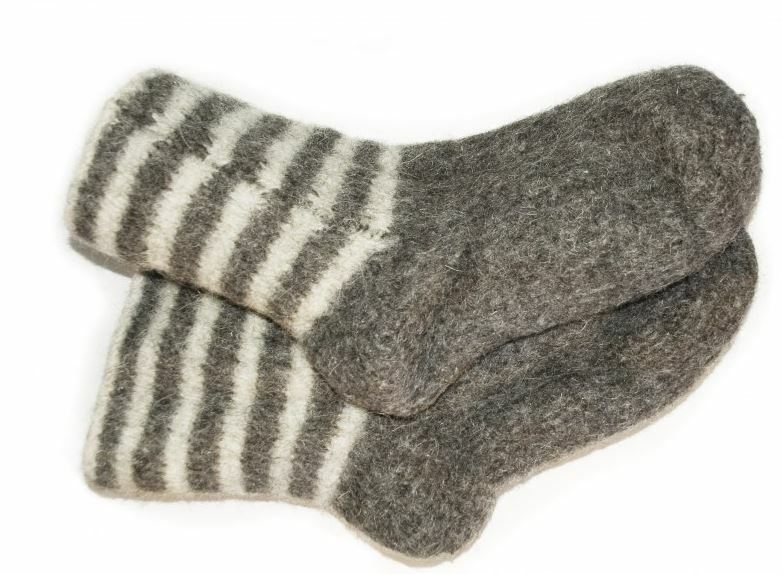 Helpful hint: you can knit socks knitting for beginners, a simple pattern of alternating stripes of different yarn. To enhance durability heel detail can make a thread in two additions.